United States Sports Academy Chair of Sports Exercise Science Dr. Vincent Ramsey demonstrates the MetaCheck Metabolic Rate Analysis System on Murphy High School student Ash Finnigan. A group of Murphy students visited the Academy campus to learn about careers in sport, sports education and to tour the Academy’s American Sport Art Museum & Archives. DAPHNE, Ala. – Students from Murphy High School recently visited the United States Sports Academy campus to learn about careers in sport, sports education and to tour the Academy’s American Sport Art Museum & Archives (ASAMA).  The students are part of Murphy’s international baccalaureate program, and most of them had taken the high school’s kinesiology and sports medicine courses. The group toured ASAMA, then visited the Academy’s Human Performance Laboratory, where faculty members Dr. Brandon Spradley, director of sports management, and Dr. Vincent Ramsey, chair of sports exercise science, and doctoral teaching assistant Jason Williams demonstrated the use of the institution’s advanced sports science equipment. 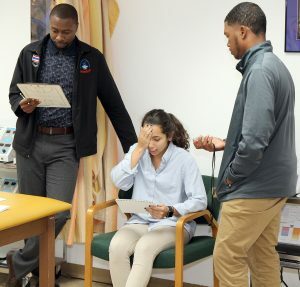 United States Sports Academy Director of Sports Management Dr. Brandon Spradley, left, demonstrates the King-Devick Test concussion screening system with Murphy High School students Mariana Orozco and Christopher Dent. The students visited the Academy campus to learn about careers in sport, sports education and to tour the Academy’s American Sport Art Museum & Archives. The students also participated in a question and answer session with Dr. Stephen Butler, dean of academic affairs; Dr. Vincent Nix, dean of student services; Dr. Fred Cromartie, director of doctoral studies; Spradley; Ramsey; Dr. Rodney Blackman, chair of recreation management; and doctoral teaching assistant Sara Weber. The session centered on how the faculty members became involved in the sports profession and what the students can do to prepare themselves for a career in the field. They also discussed trends in the sports profession like analytics, social media and NCAA compliance, where students may find opportunities when they attend college. The students also heard a presentation from financial aid and graduate admissions counselor Robin Stephens, who told the students about the Academy’s enrollment process. A group of Murphy High School students visited the United States Sports Academy campus to learn about careers in sport, sports education and to tour the Academy’s American Sport Art Museum & Archives. The students are shown with Academy faculty members, pictured on the front row from left: Director of Sports Management Dr. Brandon Spradley, Dean of Academic Affairs Dr. Stephen Butler, Chair of Sports Exercise Science Dr. Vincent Ramsey, Chair of Recreation Management Dr. Rodney Blackman, Doctoral Teaching Assistant Sara Weber, Dean of Student Services Dr. Vincent Nix and Director of Doctoral Studies Dr. Fred Cromartie. A group of Murphy High School students visited the United States Sports Academy campus to learn about careers in sport, sports education and to tour the Academy’s American Sport Art Museum & Archives. Founded in 1984, ASAMA is dedicated to the preservation of sports art, history and literature. The ASAMA collection is composed of more than 1,800 works of sport art across a variety of media, including paintings, sculptures, assemblages, prints and photographs. The museum is open free to the public from 9 a.m. to 4 p.m. weekdays. For more information, go to www.asama.org.